Published in Rafu Shimpo, August 29, 1970, Japanese section. Three men of Shorinji Kempo present a check for $257.57 to Keiro Nursing Home assistant administrator in front of the Rafu Shimpo building, in Little Tokyo, Los Angeles, California, August 1970. 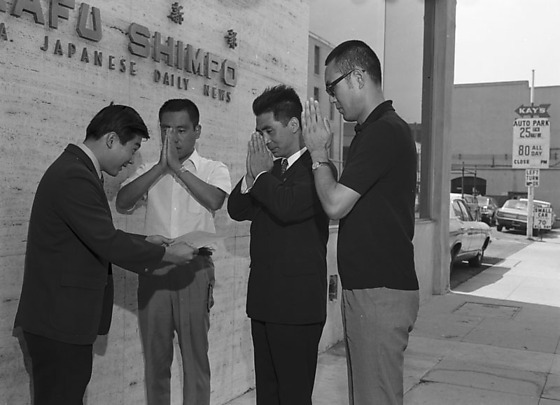 Dressed in suit, Art Ito of Keiro, bows and holds an envelope out in front of him as three men face him with hands in "gassho" in front of wall, "Rafu Shimpo, L.A. Japanese Daily News". They are identified (left to right): Ito, Mr. Togawa, Mr. Morikawa, and Mr. Yamamori, head of the school. Written on original envelope: Shorinji Kempo. The Southern California Shorinji Kempo dojo held a demonstration during Nisei Week and collected $257.70 in donations, which they donated to Keiro Home.